Rotorua's Sam Shaw drew the curtains on a magnificent 10 days of cycling with a popular home-town win in the Giant 2W Gravity Enduro mountain biking race today. The four-stage hybrid race, with both downhill and cross country elements, was the final event in the inaugural Rotorua Bike Festival. 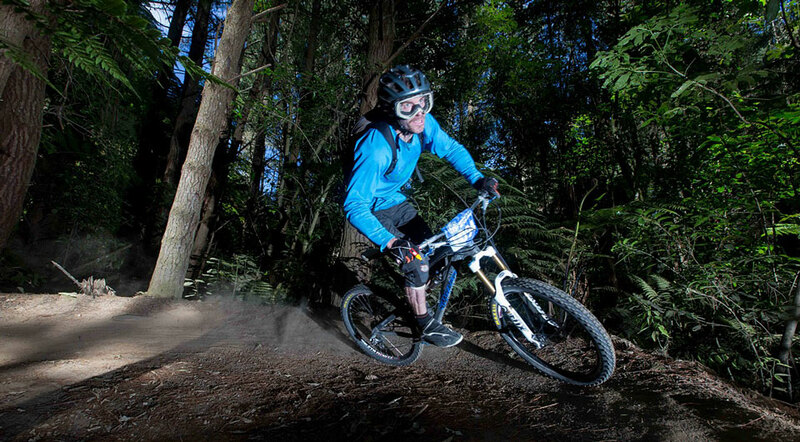 It was fitting 20-year-old Shaw, who has grown up on the vast Whakarewarewa Forest trail network, was able to negotiate the 18.4km distance in the fastest overall time, clocking 39mins 07secs and finishing 4secs clear of Nelson Enduro specialist Jamie Nicoll. "It's great having an event like this on my back doorstep and it was definitely a big advantage for me out there because I know the tracks up there pretty well, although I haven't ridden all of those ones for at least a month because I've been cross country racing all over New Zealand," Shaw said. "It was such a good time having everyone turn up and have heaps of fun and the event has got a big future." As does Shaw. Adding to his achievement was the fact he'd backed up from the day before, where he finished third in the national under-23 cross country race behind Anton Cooper and Dirk Peters. "That was my aim and I was pretty happy to follow it up with this. That base definitely helped on the longest stage today, where a lot of endurance came into it." Nearly 300 riders from New Zealand, Australia and the United States entered the Enduro, a format similar to car rallying in which riders have 5hrs to get around and ride the four timed stages. As the stunning Rotorua summer continued, with blue skies and hot sunshine, the event neatly captured the imagination of weekend warriors and serious athletes alike. One of those serious athletes was former Olympic cross country star Rosara Joseph, who showed she'd wasted no time getting used to her new discipline by winning the women's overall title. She finished 43mins 19secs, ahead of Auckland 21-year-old Sasha Smith and former world cup downhiller Jenna Makgill. Joseph, who turns 31 this week, will link up with the Yeti team to ride the Enduro circuit in the United States this year, although she admits she's still getting her head around the concept. "I did a couple of Enduro events in North America and Europe last year but I still feel pretty new to it," Joseph said. "I'm still learning a lot and working out how to do it but it was certainly a lot of fun out there and I had a great day. The tracks were super-cool and I had a good group to ride with and I found it physically really challenging." Nicoll just managed to see off the threat of Australian Jon Odams to finish second in the men's race, although he took out the 23-39 division. The Nelson rider has been plying the Enduro circuit for several seasons and came prepared for Rotorua's introduction to the format. "I put a lot of time into training because it's such a mix of cross country and downhill," Nicoll said. "I did the Sprint Warrior race on Friday night and came in eighth, which I was pretty happy with, and it helps to have that broad range like having a lot of power and getting yourself back up to speed, because you're always slowing down. This was a great event - it's certainly the most pedaling I've done in an Enduro event but I managed to get through." Organiser Neil Gellatly of Dare to Sweat Events was delighted with the weather, the turnout and the spirit of the competitors and has vowed next year's race will be even better. "It's really captured the imagination of people and is probably the most relevant event for all those riders who like coming out and spending a day in the forest with their mates," Gellatly said. "Adding the competitive element to the camaraderie gives it the perfect mix."